Go easy on modifiers. When rookie writers are asked to write description, they tend to pile up the adjectives and adverbs. But an abundance of modifying words and phrases rarely results in good writing. 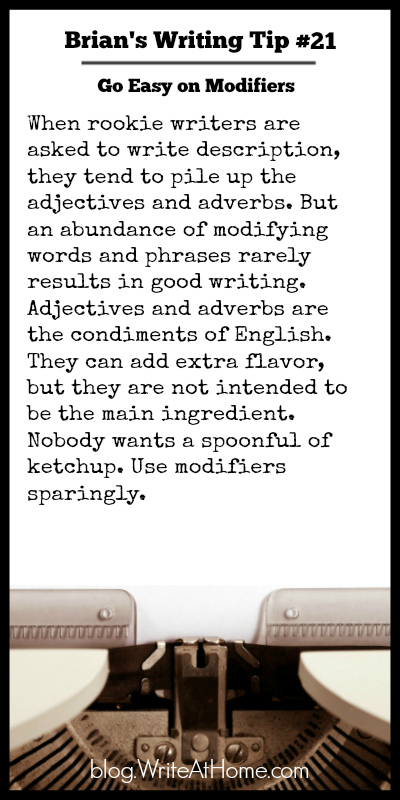 Adjectives and adverbs are the condiments of English. They can add extra flavor, but they are not intended to be the main ingredient. Nobody wants a spoonful of ketchup. Use modifiers sparingly. Make a blogger’s day: leave a comment in the space below.